1988-02-02. New. Ships with Tracking Number! INTERNATIONAL WORLDWIDE Shipping available. Buy with confidence, excellent customer service! Yale Univerisity, New Haven CT & The National Gallery of Art, Washington DC, 1986. 2nd edition. hardcover. Fine/Fine. A look specifically at three cities (London, Paris, Vienna) whose 19th century planners and architects designed to reflect the values and needs of the upper classes. Public buildings and homes fit together in a comprehensive plan that can be seen as a unit and yet the book also delves into specifics of architecture and design. Wonderful photographs. There is a protective mylar cover. Larger format. [Please check for shipping cost on multi-volume sets and larger format books.] 2ND EDITION. Yale University Press, 1988-07-27. Paperback. Used:Good. Yale University Press. PAPERBACK. 0300042124 New Condition. . New. 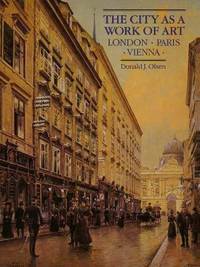 The City as a Work of Art: London, Paris, Vienna. Yale U. Press, 1986. Owner's gift inscription, else fine in fine dust jacket with slight wear to head of spine, in mylar cover. B&W illustrations and photos. Condition: Owner's gift inscription, else fine in fine dust jacket with slight wear to head of spine, in mylar cover. Yale University Press. PAPERBACK. 0300042124 Like New Condition. . Fine. Yale University Press, New Haven, 1986. 341 pages, with an extensive text, healthily annotated, indexed, and illustrated. Hardcover, half bound with brown cloth spine and paper covered boards. Minor bump to the right sides of the boards. Dustjacket is in excellent condition, save for some wear to the crown and foot of the spine, and to the corners.. Cloth. Near Fine/Near Fine. New Haven, CT.: Yale University Press, 1986. Hardcover. VG in VG dust jacket. Oversize hardcover, general wear, well bound, former owner's name on title page, short ink note on rear paste-down page, o/w clean and unmarked. Some edgewear and rubbing to dust jacket. A very good reading copy with no major faults. Yale UP, 1986. 4to. 341pp, 142 plates, card covers, slight wear, spine creased, G/VG Detailed study of the 19th century development of London, Paris & Vienna. Yale University Press, July 1988. Trade Paperback. Used - Very Good. Very nice clean, tight copy free of any marks. Yale University Press, 1988-07-27. Paperback. Good. Yale University Press, July 1988. Paper Back. Good. Yale University Press. PAPERBACK. 0300042124 No CD Included. Access code may be previously used. Moderate dirt wear, wrinkling or creasing on cover or spine. Good binding. Moderate writing and highlighting. Cover has used book stickers or residue. Marker on cover or bottom edge of book. . Good. Yale University Press, 1988. Paperback. Very Good. Disclaimer:A copy that has been read, but remains in excellent condition. Pages are intact and are not marred by notes or highlighting, but may contain a neat previous owner name. The spine remains undamaged. At ThriftBooks, our motto is: Read More, Spend Less.Dust jacket quality is not guaranteed. Yale University Press, 1988. Paperback. Acceptable. Disclaimer:A readable copy. All pages are intact, and the cover is intact. Pages can include considerable notes-in pen or highlighter-but the notes cannot obscure the text. At ThriftBooks, our motto is: Read More, Spend Less.Dust jacket quality is not guaranteed.